WASHINGTON - Six months after leaving her post as secretary of state, Hillary Clinton is jumping back into the public sphere. At the American Bar Association Conference today, Clinton announced a series of speeches to address high profile public policy issues including voting rights, which she addressed today. Next month in Philadelphia she plans to deliver remarks on the balance transparency in national security policies, likely addressing the controversy over the National Security Agency's spying programs. A third speech will focus on the impact of U.S. national security policies on its reputation abroad. Devoting her first speech to what she called the "assault on voting rights," Clinton denounced the Supreme Court's invalidation of pre-clearance requirements in the Voting Rights Act, which require jurisdictions with a history of discrimination to clear voting law changes with the federal government. "Some take the historic success of the Voting Rights Act as a sign that discrimination is a thing of the past," Clinton said. "By invalidating pre-clearance, the Supreme Court has shifted the burden back onto citizens facing discrimination and those lawyers willing to stand with them." And she condemned efforts to tighten voting requirements in several states including Florida, Texas and North Carolina, whose voting rights law she dubbed "the greatest hits of voter suppression." "Anyone who says racial discrimination is no longer a problem in American elections must not be paying attention," Clinton said. Since leaving her post in the Obama administration, Clinton has selectively chosen her public appearances, launched a new early childhood initiative at the newly renamed Bill and Hillary Clinton Foundation, and worked on a forthcoming book. But today's announcement signals that she intends to be actively engaged in policy from outside the administration, and will undoubtedly fuel speculation about her political future. 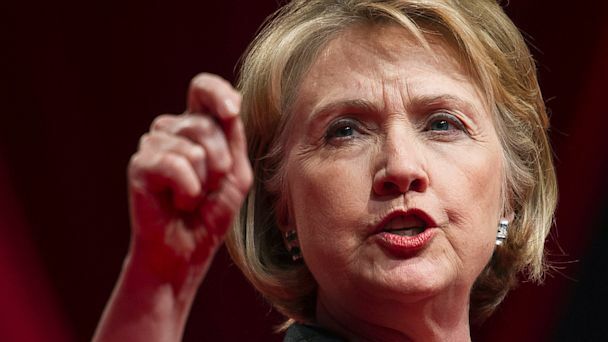 Clinton called for a multi-pronged approach to addressing threats to voting right. She called on Congress to move quickly to restore the invalidated portions of the Voting Rights Act, praised Attorney General Eric Holder's efforts to enforce other portions of the law that are still in effect, and encouraged the legal community to continue to speak up on behalf of fair election laws. Unless Congress moves to restore the Voting Rights Act, Clinton said, "Citizens will be disenfranchised - victimize by the law, instead of served by it." "And that progress, that historical progress toward a more perfect union, will go backward instead of forward," she said. "Our government cannot fully represent the people unless it has been fairly elected by them."